The trek to Sinhagad Fort is a thrilling adventure that begins with trekking amidst the beauty of the Sahyadri mountains and ends with a visit to the historic Sinhagad Fort. 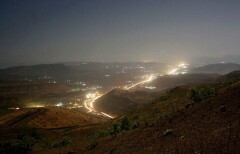 During your journey, you will trek across 17 hills of the Sahyadri mountain ranges that are covered with thick forests. Under a bright sky, this unique experience offers gorgeous views of rolling mountain peaks and the city of Pune on the horizon. Rumoured to have been built over 2000 years ago, the ancient Sinhagad Fort brings with it an action-packed history of battles and wars. On this trek to Sinhagad Fort, you will begin trekking from the Katraj tunnel and travel across a series of hills. Under the cover of dense forests, your route will lead you through ridges and folds of the Sahyadri mountain ranges to reach the Sinhagad Fort. Catch amazing morning views from atop the mountain fort and explore the intricate architecture and interior of this archaeological monument. • Trek under dense forests to reach Sinhagad Fort. • Trek across multiple rolling hills in the Sahyadri mountain ranges. • Explore the memorials and ruins of the ancient Sinhagad fort. Consumption of alcohol and narcotics is strictly prohibited during or before the trek. Cancellations made more than 10 days before departure of the trek to Sinhagad: 90% refund. Cancellations made between 10 to 6 days before departure of the trek to Sinhagad: 75% refund. Cancellations made less than 6 days before departure of the trek to Sinhagad: No refund. Please note that washroom facilities are not available during the trek or at Sinhagad Fort. The tour operator takes utmost care to ensure safety of the travellers and shall not be held responsible for any mishap, accident or loss of life during the trek. Meet the rest of your group at the Swargate bus stand by 05:15 hrs. From here, you will board a state transport bus and travel to the Katraj tunnel. After reaching the base by 06:30 hrs, begin trekking towards the Sinhagad Fort. Begin an uphill climb through the Sahyadri mountains and stop at vantage points to admire the scenery and click photos. You'll arrive back at Swargate by 15:00 hrs. Your trip ends here. Trekkers making their way through rich grassy fields. No meals are included in today's meal package. Please bring a packed dinner to eat during a scheduled break in overnight trekking. Please note that toilet facilities are not available during the trek or at Sinhagad Fort. Accommodation options are not available since travellers will spend the night trekking. Today's meal package includes tea and breakfast at Sinhagad Fort. After spending some time to explore the fort, you will board a state transport bus back to Swargate, Pune. Swargate, Pune is connected to nearby cities by road via local transport of taxis and buses.